Joseph John Vitko III was born on February 1, 1970 in Somerville, New Jersey. He was born 19 years before the Bridgewater Commons Mall was built, in an area that boomed with pharmaceutical company growth in the 1990s. He played high school baseball in nearby Pennsylvania, then attended St. Francis University at Loreto, PA. The tall six foot, eight inch right hander would be drafted by the New York Mets twice. The first time, was in 1988 but he did not sign. Then the following year he signed in the 24th round. He put up good ERAs in A ball, going 8-1 with a 2.49 ERA in the South Atlantic League at Columbia in 1990. 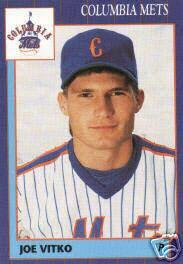 In 1991 he won 11 games for the A ball St. Lucie Mets. The following year he was promoted to AA Binghamton, winning 12 games there as well. Vitko has two interesting trivia statistics to his credit; the first being in 1992 he was the first Binghamton Met to make the big league team. Second, he is officially listed as the first Mets player to be born in the 1970’s, after the Miracle of the 1969 World Series. On September 18th 1992, he made his MLB debut, pitching at Shea Stadium, closing out a Dwight Gooden loss to the Montreal Expos. He got hit hard in his next outing, giving up five runs on four hits in an inning and a half of work against the Chicago Cubs. Vitko got his only career start & only decision on September 28th, against the Phillies at Shea Stadium. He allowed six runs on seven hits taking the loss, ballooning his ERA to 13.50. 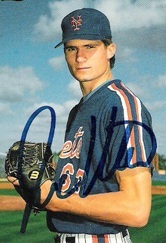 He then suffered arm problems, pitching only seven innings in two games at St. Lucie in 1993. In 1994 his last attempt at a comeback had him going 2-5 at AA Binghamton, but his career was finished at the end of the season.